There are no shortage of audio players in Linux. It has everything from command line MP3 players(mpg123) to RAM eating GUI players(like Amarok). With easily available codecs, linux supports almost all available formats. amaroK is currently the player of my choice – it rocks. Everything I ever wanted in a MP3 Player and more. It is the clear winner in this field. In my opinion, there is nothing that beats amarok even if you look at Windows and Mac MP3 players as well. 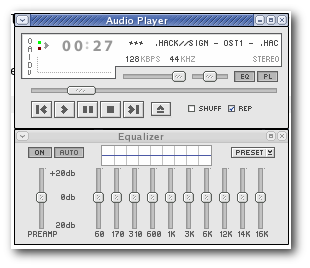 A Winamp clone. Simple and user friendly, it is very popular on linux. It does not have a large feature set – but I am going to give it second place due to its popularity. 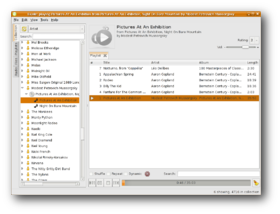 Rhythmbox Music Player is a music player and library for tagged files, that support various music formats. It was inspired by Appleâ€™s iTunes. Although it is designed to work well under the GNOME Desktop, I had no issues with it in KDE. Audacious is not among the ‘star media-players’ in Linux – so many people never try it out. But those who have tried it out like it. For the sake of the article, I installed it – and I liked it. I even considered switching from amaroK to Audacious. Banshee is an MP3 players for Gnome. You can import, organize, play, and share your music using Banshee’s simple, powerful interface. SongBird is an MP3 player built on the XUL framework. It’s a desktop media player mashed-up with the Web. An audio jukebox that supports collections of MP3, Ogg Vorbis and FLAC files. It is a part of the kdemultimedia package. mpg123 is a fast, free, minimalist, console MPEG audio player software program for UNIX and Linux operating systems. Pingback: What to do with MP3s in Linux » Oojah! It really annoys me that you have to stuff around and download special codecs and patches to make some Linux players play MP3s. Probably a copyright issue I guess. Would have been nice to see Decibel Audio Player tested, it’s a cool and simple app IMO. Thank you for the review. I installed amarok and im already loving it. Para mi el mejor es audacious, nunca truena, es ligereo, un verdadero clon de winamp y desde luego, fÃ¡cil de manejar. Tambien el mpg123/321. Look at foobar2000 under Windows, and you what I mean. Btw, “nothing can beat it” 🙂 Nothing offensive, but I do miss such features under Linux players. Add column called Directory and sort using it. Possible – there is a button in the status bar. I’m talking about Amarok 1.4 – not sure if these features are enabled in Amarok 2. I have to agree with Ilya, i tried every player in linux, cue support is missing in the vast majority, only audacious supports but i hate winamp, i still use foobar under wine, sadly it doesn’t support drag and drop. The most annoying thing is sorting by albums, i want folders, songbird is close to my needs but doesn’t synchronize with my mp3. thanks a lot … dont really like rythmbox .. lets try out ur amarok. The fuzzy-search feature of ‘Yammi’, and the speed at which it can handle 30,000+ song libraries (both initial scan, and in use) makes it irreplaceable on my system. Even as it still uses KDE3.5 & hasn’t been supported for years. I like the amarok. It works great! I enjoyed this site getting something new. The SuSE standards like the Amarok, Banshee, Juk all do badly SegFaults on my machine, the XMMS crashes for “Doublesize” and Audacious goes down when playing an 128 MP3 and trying to change the volume. Also the audio output plugins from audacious are heck. RhythmBox and Exaile do the job for my modern times. I currently run a SuSE 11.2 with some Packman updates (Gstreamer and so on) on an older K6 machine which has been trusted to be OK for many years. A Player I like very much and is not yet meantioned here ist the good old Alsaplayer. It is lean & mean and does the job and has went better with every version. If we come to the mpg123 player, we should also note the mp3blaster Player, which is about monolithic and really extremely rugged & stable. If no other plays, mp3blaster will still do. About the same, and a thing for the “vi” Fan is the cmus Player. Old amarok rocked, new is eh… more of gnu/unix idea – he doesnt support that many opts as former has, cause there are different apps for that (autotagging for example). Amarok # 1 ? No equilizer, cluttered interface, hopeless with podcasts and this is #1 ? Sorri I’m still looking for a stable, basic mp3 player for suse 11.2 KDE that actually works. I tried xmms and stopped immediately because they are bugging me with this ever annoying daemon-thing. How crazy a man must be to invent a daemon for a simple mp3-player – well that’s linux…. I can’t believe quodlibet didn’t make the cut– not even the cut cut. I like and use XMMS at work because it looks so much like Winamp..
@Michael: Very true, it’s annoying and totally unnecessary, really a shame since it makes a good first impression. Why don’t you try foobnix player? mpg123 is the best. It is fast, its sound quality is best. does the job for me. press ‘s’ / ‘space’ to pause, ‘f’ for next song, press ‘h’ for full list of control keys. mpg123 is the best and best and best. @dbbolton: Damn right! QuodLibet is the one! It lets me organize my music the way I want, that is, the way it’s organized in my music folders, and it plays it! That’s all I ask of a music player and it does it superbly! Just installed Audacious after trying (and failing) to get both Amarok and Rythmbox to recognise my (huge) collection of music in windows. Audacious plays it all….. nough said! Rhythm Box doesn’t seem to handle podcast subscriptions? SongBird has worked best all around for podcasts and playing music on my computer but can’t deal with Sansa Clip. I would love one piece of software that does all three tasks. I have to take it all back. SongBird for Linux has been dropped. Rhythm Box now doing podcasts just fine. Don’t know what changed…. QuodLibet is my favourite as well, since I hate any overloaded stuff with features I don’t need…and it does the job it should do. Great post. I am installing Amarok right now. I usually use Rhythmbox but, since I upgraded my system to F14, my mouse locks up when I open Rhythmbox. 🙁 Thank for the great post. Thanks for the hints! Totem did it for me as long as I required no library management. To have it, I switched to Rythmbox, as it comes default with Linux Debian. For me, foobar2000 is the best on windows. I couldn’t use itunes or windows media player because my library was far to large and neither would just play my music because anything they played they tried to add to their library and would eventually choke. And around the time my old laptop died, foobar eventually started having some stuttering when I would sort artists or other higher up tags, but that was easily fixed by telling it not to queue songs without a double click, which stopped the lag of it trying to queue several hundred songs at once. Also Itunes thought I didn’t know the names of the artists and decided to change some things. One band would have all of it’s tags under artist changed to someone else simply because one of the songs was named the same as the band it was changed into. A couple thousand tags were changed and when I would correct it it would change it back, it was a disaster so I uninstalled itunes immediately. Now when I started using ubuntu, I tried the default banshee, but it couldn’t handle my library and I encountered a similar problem to itunes with it attempting to keep track of the songs I listened to which would eventually mean trouble. So then I tried Clementine and it was okay, but it seemed to want to eat all memory, which was strange because I had heard it was lightweight when it came to resources, could be my system was weak, but I doubt anybody would consider 2 GB of ram usage to be lightweight. Foobar was what I would consider lightweight and I had a very large library then and a very strict id3 tagging philosophy with many custom tags even. I eventually decided to use a player that would play my music when I wanted to, without the hassle of it managing a large library. My library was scattered across five folders, each around 10 GB in size, and none of them were in any kind of order, other than music in music 2 I got before music in music 3 and so on. Foobar managed my library with tags, but the tags were pretty much irrelevant now. So I organized my music. It took long enough, but it was worth it. It’s so much easier to manage it yourself once it’s all organized. It just takes a couple minutes to add folder structure and keep the music organized. And much less time worrying about if a program will sabotage your hardwork. And because it’s already organized, I don’t need a program to keep a library. I like Audacious. It CAN play all 11705 of my songs if I were to get it to. It doesn’t have a tree view or anything. I just select a folder I want to play. I can select an individual album to play or I can right click/menu an artist’s folder to play the whole thing and right click and play. Or drag and drop queue. And sound quality is superb. Also I wanted to mention that Audacious has a gtk interface. It’s simple, looks like foobar’s starting interface, but cleaner. So if you don’t like winamp, or winamp like interfaces, you can use the gtk interface. Im Moment ist es noch eine Beta Version, aber die finale Version kommt bald raus. Atm, it’s a beta version but the final version will be released very soon. Sorry about the German post. You can delete it..
Have you tried sawanna player ? It’s simple but has everything you need. You must try aTunes : to be discovered. I agree with you: Audacious is lighweight, very fast, and gets mosts of the really necessary features. No one mentions Clementine yet? It’s pretty solid. Thanks, but this is useless to me, as I am not admin on my linux machine. I can’t install packages, and I can’t use makefiles because they inevitably try to install the software into system directories that I can’t write to. The only one I was able to install was the java-only version of mpg123, and that plays every file with so many clicks and pops that I can’t listen to it. Is there any linux MP3 player I can compile that provides config options to install and run EVERYTHING in a local directory? Great list. I just became a full time Linux user and I really missed winamp. Your review of the xmms player was just what the doctor ordered. I now feel completely at home with my Linux box. Thanks !